I thought I was ready to wrap up all of the home brewing equipment today, but as I was putting together the post I realized that I missed one piece of equipment that will improve your home brewing a notch or two and make your life a little simpler. What I’m talking is the wort chiller. Most home brewers that I know, start off cooling their wort down with an ice bath in the sink or maybe the tube. It’s effective, but it can take a while and uses a whole lot of ice and water. 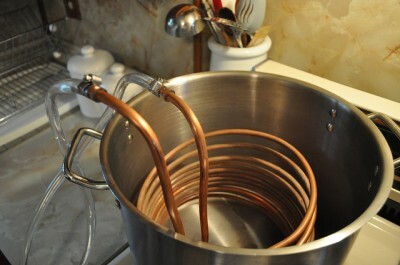 A wort chiller is better because it cools down your wort quicker and with less water. The speed that it cools down your wort is the reason that many home brewers eventually get a wort chiller. The longer it takes for your wort to cool down, the great the risk of infection from outside sources like bacteria and bad yeast. Plus, the longer it takes to cool down can lead to some off tastes in the finished the product. The most popular kind of wort chillers, is the immersion kind. It’s a cooper tube that has been rolled up so that you can fit it into your brew pot. Water from a garden hose or faucet is then circulated through it, absorbing and carrying away the heat until it’s cooled down to the temperate that you want. Immersion wort chillers cost between $50 and $100, depending on the quality, so if you’re just getting started out it’s okay to wait on buying a wort chiller until you’re sure that you’re really interested in home brewing. Eco-Friendly Tip: Use the water from the wort chiller for your next load of clothes in the washer or to water your plants. The water is clean as it comes from your tap because it never comes in contact with the wort and is a whole lot better than just pouring it down the drain.